For event times, and to save your spot, register by email (info@foca.on.ca) or call the FOCA office during business hours: 705-749-3622. 2020 Season – Contact FOCA now to plan an in-person event near you for next summer. 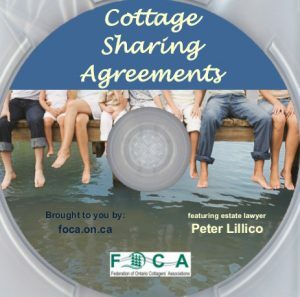 FOCA has been “on the road” with estate lawyer Peter Lillico for the past decade, bringing information to cottage owners about ways to keep the cottage in the family for the next generation. KEEPING THE ‘FAMILY ‘IN THE FAMILY COTTAGE (this is the recommended introductory/overview session) – Cottage succession planning intro, with an overview of the legal, tax and family issues that need to be addressed. AVOIDING ADVERSITY – Why a Cottage Sharing Agreement is the crucial first foundation for shared future family cottage ownership; what protections and provisions they must include; and how best to develop one for your family. 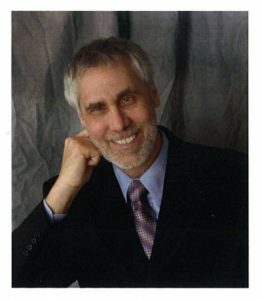 TARGETING TAX – How capital gains tax works; how to avoid it; techniques to reduce or defer it; planning approaches to fund it. COTTAGES AT THE CROSSROADS: Choosing the Path – This session assumes the cottagers want to keep the cottage in the family and explains the pros and cons of different succession vehicles: Direct personal ownership by children; corporate ownership; or trust ownership. 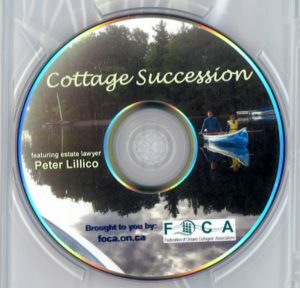 Please contact the FOCA office if you are interested in holding a Cottage Succession event in your area in the future. DVDs now available for FOCA Members! June 2018 – Peter Lillico is quoted in this article: “What to know about owning a cottage with friends or family,” Times Colonist. Peter is also the backbone of this article: “How to hand down your cottage while keeping the peace and saving money,” Cottage Life, by Penny Caldwell. “4 different ways families approached cottage succession,” Cottage Life, by Penny Caldwell. In early June 2016, FOCA met up with the American Friends of Canadian Land Trusts (AF) to discuss the connection between conservation and cottage succession planning for American owners of property in Ontario’s cottage country. AF helps U.S. taxpayers learn about and address the challenges of Canadian capital gains, and explore how they can create a conservation strategy for their lands that will meet their financial goals.